Painted pavement markings are a time tested method to stripe low profile surfaces. Extruded Thermoplastic pavement marking is a durable marking typically applied on an asphalt surfaces. Extruded Thermoplastic is designed to last longer than paint and is a proven way to reduce maintenance costs. Preformed Thermoplastic is one of the most durable pavement marking in theindustry. These highly durable & reflective markings are used for legends, symbols, transversal lines. It is applied using industrial heat torches and an adhesive depending on the surface it is applied to. Cold Plastic Tape is a durable pavement marking used for legends, symbols, and transversal lines. Methyl methacrylate (MMA) based pavement markings are the most durable pavement marking materials available anywhere today. 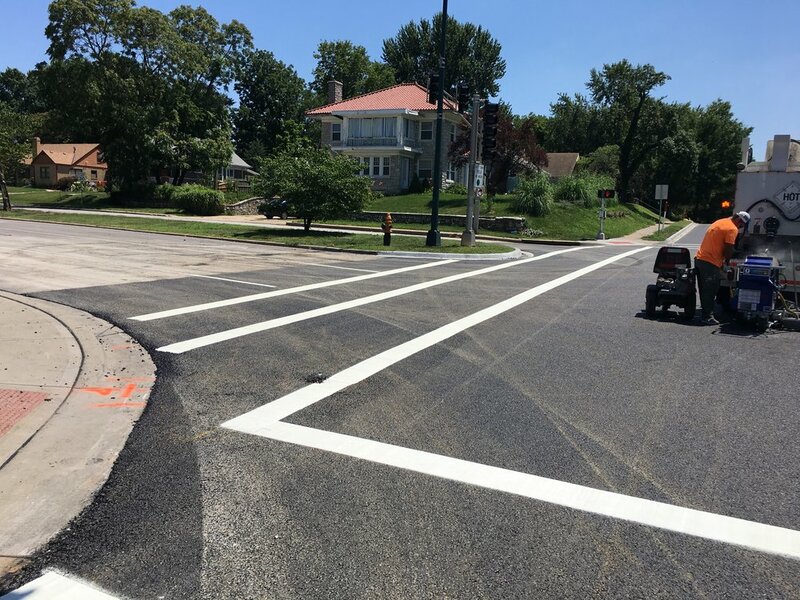 MMA can be surface applied onto asphalt or concrete roadways or inlaid for longer service life, and is engineered for durable long line as well as transverse markings even in extreme conditions. Contact us for quote requests and/or other roadway marking inquires or call us at 816-741-3339.